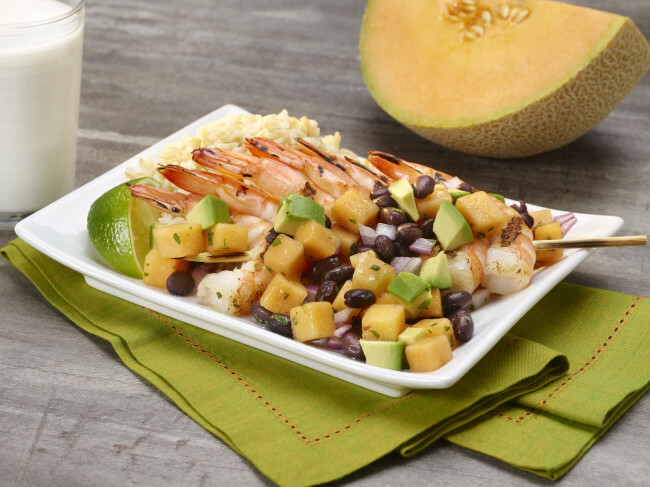 Savory sweet salsa featuring cantaloupe and avocado is the perfect complement to grilled shrimp. Add remaining salsa ingredients and gently mix. Peel shrimp, leaving tails on. Skewer shrimp on bamboo skewers. In a small dish mix together canola oil and garlic. Coat shrimp with oil-garlic mix. Grill 4-5 minutes or until cooked. To serve, top shrimp with salsa, garnish with lime wedges. Serve with 8 oz non-fat milk and brown rice.